What is “forward” and “reverse” voltage when working with diodes? What is the difference between "forward" and "reverse" voltages when working with diodes and LEDs? I realize this question is answered elsewhere on the interwebs such as wikipedia, but I am looking for a short summary that is less of a technical discussion and more a useful tip to someone using diodes in a hobby circuit. The forward voltage is the voltage drop across the diode if the voltage at the anode is more positive than the voltage at the cathode (if you connect + to the anode). You will be using this value to calculate the power dissipation of the diode and the voltage after the diode. The reverse voltage is the voltage drop across the diode if the voltage at the cathode is more positive than the voltage at the anode (if you connect + to the cathode). This is usually much higher than the forward voltage. As with forward voltage, a current will flow if the connected voltage exceeds this value. This is called a "breakdown". Common diodes are usually destroyed but with Z and Zener diodes this effect is used deliberately. 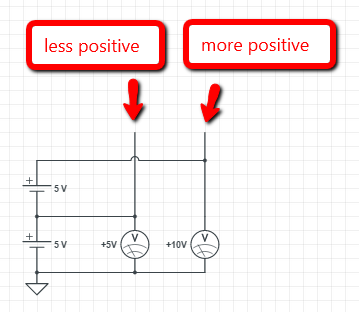 Forward-bias is when the anode (the pointy part of the symbol) is positive and the cathode (the bar) is negative. Reverse-bias is when the anode is negative and the cathode is positive. A lot of current flows when the diode is forward-biased, provided that the voltage is higher than 0.6V or so for a silicon diode or 0.3V or so for a germanium device. A very small amount of current flows if a diode is reverse-biased. If you have a DVM and some diodes, you can check it for yourself. Diode cathode leads are usually identified with a band, so if you switch the DVM to a low resistance setting, and connect the leads across the diode in both directions, you should see a low resistance in one direction and a high resistance in the other direction, provided that the DVM is supplying a high enough voltage. Some DVMs have a special diode test setting that is easier to use. LEDs usually have a flat against the cathode lead. Typically, the forward voltage of an LED is about 1.8–3.3 volts; it varies by the color of the LED. A red LED typically drops 1.8 volts, but voltage drop normally rises as the light frequency increases, so a blue LED may drop around 3.3 volts. Although you mention "voltage," I believe you mean bias. If this is correct, then "forward bias" is the application of a voltage in such a way that the diode "shows" a low resistance. "Reverse bias" causes the diode to show a high resistance. Forward voltage is the one that makes the diode to conduct while the reverse voltage is the one that makes a diode very bad conductor or almost an open circuit unless diode "breaks down". For perfect junction diodes there is a relation between the current and the voltage given by Shockley's diode equation I = Is(exp(Vd q/nkT). You can solve this to get Vd, the diode voltage, as a function of I. But when you have a resistor in series with the diode, you can NOT solve the circuit; you must use successive approximations. (Unless you have a WP-34 calculator with the built in Lambert W function, of course.) Ordinarily, you can replace nkT/q with about 0.6 volts, and saturation current Is with about 1 mA, and your voltage calculation will be in the ball park. Google "shockley diode equation" to learn more than I can type here. Not the answer you're looking for? Browse other questions tagged led diodes or ask your own question. What is meant by Vf? How do I power 100 LEDs in series with low voltage? Is there anyway to detect lowest voltage of a signal like capacitor and diode do for the high one? When is a reverse current diode protection needed for linear regulators? LEDs intermittently non-responsive to short multiplexed pulses after high reverse voltage? How these two diodes used in the ciruit protect from the voltage spikes?